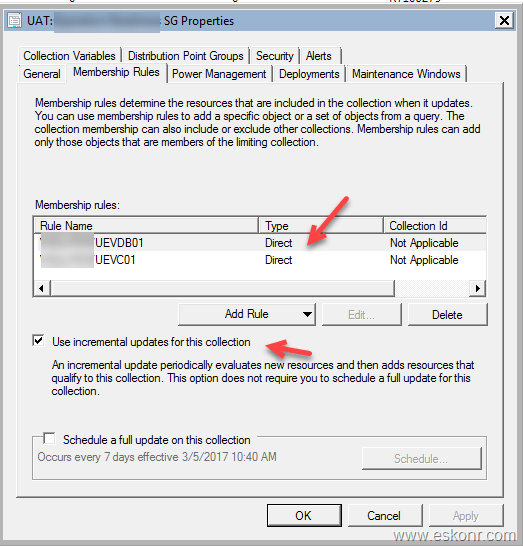 This blog post is continuation to my previous post ‘Monitor collection evaluation's and remove incremental membership schedule for non-priority collections’ .More information can be found at http://eskonr.com/2019/01/sccm-configmgr-monitoring-collection-evaluations-and-change-update-membership-schedule-using-powershell/ . In this post ,we will see how to improve the collection evaluation performance further by identifying list of collections with direct rule created that have membership (incremental and/or full update) enabled and use powershell to remove the membership schedule. Direct Rule: This is a static collection (manual changes required all the time) which means the membership does not change unless you remove a resource from SCCM. Query Rule:This is dynamic collection and it dynamically update the membership of a collection based on a query that SCCM runs on a schedule. As you see in the above snapshot ,the type of rule is Direct for direct (static) based collections and for query based collections,you will see Query in-place of direct. Direct rule collections do not require the membership enabled because these collections are static and they never get update again and again unless user do manual changes . If you are adding the resources to direct based collections using scripts then make sure you also use the syntax to update the collection membership right there in the script .This is required for direct based collections if you did not enable the incremental or full schedule update. Why is it required to update collection membership if you use script to add resources direct based collection (consider no membership enabled ) ? If you are adding the resources manually to the collection using GUI then it does refresh the collection automatically and get the resources into the collection for you where as through scripting ,it doesn't get the resources but just that ,the resources will be only added to the collection (GUI as i shown above) but if you open the collection ,it will be empty (this is what i noticed in my testing with scripting). With this ,we now need to identify the collections that are direct based which have schedule membership enabled (incremental or/and full update) and remove the membership using powershell script. Following is simple powershell script to query direct based collections with membership schedule enabled. we are using built-in SCCM powershell cmdlet get-CMcollection to get all collections (user and device based) that have membership enabled (SMS_CollectionRuleDirect). This script will save the list of direct based collections with schedule enabled to CSV file for reference at later stage. If you have any direct based collections to exclude from this ,you can use script that i posted in previous blog. Depends on your infra and number of collections you have ,it might take sometime . For me ,it took 4 min to get 700+ collections that fall in the criteria. Note: Before you run the script in production ,make sure you understand the requirement and also comment the $Collection.Put() so you can verify the list of collections you have infra and rerun the script by un-comment the line. Title: Update membership schedule for collections with direct based rule. Direct rule based collections do not need membership enabled. $RefreshTypeto='1' #This is to convert the membership schedule ,1 is to remove the schedule. $collectionsfound="$CD\collections with direct rules-"+$date+".csv" #This is our output file to pipe all collections with direct based rules for our reference later. import-module (Join-Path $(Split-Path $env:SMS_ADMIN_UI_PATH) ConfigurationManager.psd1) #Import the powershell module . Make sure you have SCCM console installed on the PC that you run the script . Following is the SQL code to pre-check and post-check the collections with membership schedule enabled. Hope you enjoyed reading this article. See you in next post! 4 Responses to "SCCM Configmgr Remove Collection membership for Direct rule Collections using Powershell"
in some cases collections may have both query and direct membership rules and just modified your script to pull only Direct membership rule defined in collections and exclude if collection is having both query and direct membership rules. Thanks for it, it helps others.